Storefront Entry Doors, Commercial glass store front entry doors are completely reassembled in our controlled factory environment. They are delivered pre-hung in the frame and ready for immediate installation. Glass store front doors are available as a single door unit 3’ wide x 7’ tall (3070) and as a double door unit 6’ wide x 7’ tall (6070). Frames options are clear anodized (silver) or bronze anodized (dark brown). Single pane ¼” tempered glass and double pane 1” insulated tempered glass are both available. Storefront doors are customization with several options for sidelites, transoms, panic exit devices, bottom rails, and other hardware options. 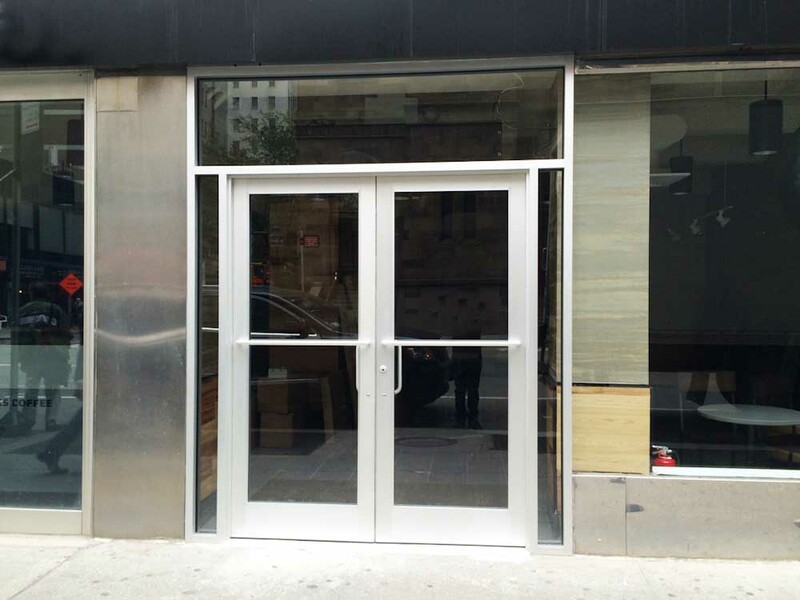 Commercial Glass Entry Doors are perfect for any retail business. Your storefront door can be designed for any size business and can be customized to fit all of your business needs. We offer a wide variety of customization options. Get your door repair done now by professionals! At Ontario Door Repairs, we have door specialists with over a decade of experience in door repairs. We can attend at your location within 30-60 minutes of your call to help you sort out any type of door related problems. Subsequently, we guarantee the proper installation, repair and maintenance of all your doors. Book a boarding up or repair service 24/7. Contact The Ontario Door Repairs now at 647-951-3510 for instant response and affordable solutions. Fast response – 30-60 minutes at your door! Prompt repairs – Most door issues fixed within 1 hour of your call. 24/7 Service – Midnight board-up and burglary repairs available. Experienced door locksmiths – That has all the required material and tools. Door Repairs in Ontario and local suburbs – Anywhere within the GTA Ontario. Commercial and residential door repairs – All types of doors. Complete door installation service – when required. Long-standing repairs – to serve you well long after the work is completed. 5 Star Rated company, Anywhere online – Search for our reviews and see. Affordable rates – No call out charges. No fix no fee policy. 12-months warranty on all door repairs. Friendly and responsive Customer Service throughout the repair process and long after.